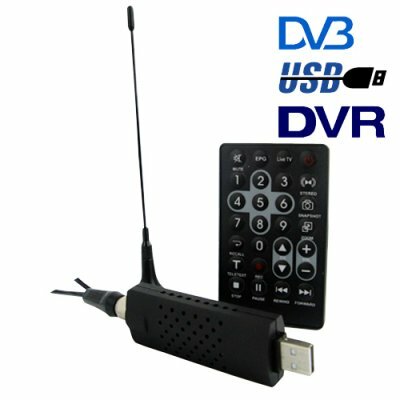 Successfully Added DVB-T Digital TV USB Receiver - Perfect Laptop Companion Edition to your Shopping Cart. Digital TV USB Receiver - Perfect Laptop Companion Edition for life on the go wherever your journey takes you. Tungjatjeta, Grüßgott or Yia Sas! However you say "hello", say hi to this great little DVB-T USB dongle that is ideal for wherever your travels lead you. Whether it's Albania, Austria, or Greece, this digital TV dongle lets you receive DVB-T channels wherever digital broadcasting is available. What's more, one you install the included software (or your favorite open-source TV recording software) and you have a fully functional digital video recorder (DVR) on your hands! Simply insert this USB accessory into your notebook, laptop, or netbook and instantly transform your computer into a powerful entertainment center. Follow the latest news and happenings from around the world, or just follow your team's scores! This DVB-T receiver is thoughtfully designed to provide real world reliability with its solid exterior and vented chassis which allows for better heat dissipation, meaning better signal gain and faster performance. What's more, the magnetic antenna also plugs directly into the dongle through a BNC connector allowing for a more secure connection. Never miss another episode of your favorite digital TV show again! Just hit "add to cart" to get a sample of this amazing Digital TV USB receiver right away and then buy a dozen to resell on your online store. This and other great USB accessories are brought to you by the leader in the direct from China wholesale electronics - Chinavasion. Sono rimasto veramente allibito per la professionalità, puntualità e immediatezza della spedizione. that's a very good for future .I think that dvb tv is a most popular.or will .but I sure.